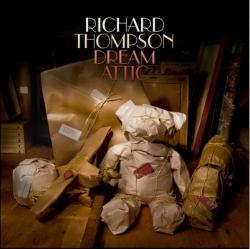 Dream Attic was nominated for a Grammy in the Best Contemporary Folk Album category in December 2010. (This was the second Grammy nomination for projects engineered by Tony Brooke.) The album reached #20 on the UK albums chart, and reached #83 on the Billboard 200 chart. In February 2010, Tony Brooke recorded a tour for the legendary Richard Thompson, which resulted in "Dream Attic," an album of thirteen new songs. This tour had a unique plan. Each night's first set presented thirteen new songs, played live, in the sequence they would soon have on the album. In essence, it was a recording session combined with a preview of a CD release listening party. Richard described the second set as containing "the old hits, such as they are." The shows took place at The Showbox (Seattle WA), The Aladdin Theater (Portland OR), The Shedd Arts Center (Eugene OR), The Van Duzer Theatre (Arcata CA) and three nights at The Great American Music Hall (San Francisco CA). The band for this project was Pete Zorn, Michael Jerome, Taras Prodaniuk and Joel Zifkin. The album was mixed perfectly by Simon Tassano and mastered by Jim Wilson. Dream Attic was also released as a limited edition deluxe set which included acoustic demos of the songs.